London - Designed to create an inclusive gateway to all things Jewish, London's brand new £12 million Jewish Community Centre - JW3 - has opened its doors to offer a wealth of cultural and entertainment spaces - including a Performance Hall designed collaboratively by the project's architects, Lifschutz Davidson Sandilands and theatre consultants Charcoalblue. Modern, forward thinking and fun, the 268-seat Performance Hall has been created to provide a reconfigurable space for larger events and functions. Charcoalblue's head of technical design, Paul Franklin, advised on the design and fit out of the performance hall and oversaw the works on site during construction. "The Performance Hall is a flexible, multi-function room, capable of hosting a wide range of events, including drama, dance, live music - both amplified and acoustic - as well as film and 'NT live' type events, lectures and workshops," explains Franklin. "It will also cater for flat floor events such as functions, exhibitions, book weeks etc. Seating can be configured over two levels, stage (ground) level and gallery. The gallery connects the Hall to the mezzanine level of the building and contains two rows of seating as well as providing a home for the technical control position." The Jewish Centre reports that over 4,500 people have streamed through its doors every week since opening. 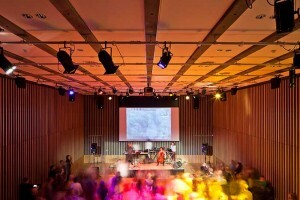 Having already hosted a wide range of jazz, hip hop, comedy, theatre, talks, school assemblies, parents' evenings, dance and more in the main Hall alone, Raymond Simonson, chiefeExecutive of JW3 says he is delighted with the outcome: "Charcoalblue has been amazingly supportive throughout the project. To be honest, I don't know how we would have done it without them. We were inspired and excited by their ideas and the subsequent development of the project itself. We could not be more fortunate in having such a magnificent community centre building designed and built by such an accomplished team. My job now is to ensure that what goes on inside the building is just as exceptional in terms of creativity, quality and variety as it looks outwardly." An uncluttered and resilient space, the Hall offers mainly end-stage and flat-floor formats. Charcoalblue delivered this by specifying a combination of a retractable seating system and loose seating, which allows for a variety of formats, audience capacities and stage sizes. "All the systems that Charcoalblue has designed are specified to ensure not only that professional standards are met, but also that they are also easy to use for the less experienced. The Performance Hall is there to provide a well-equipped and safe space that can cater to all kinds of end user, whether professional or amateur, and enable them all to create an event to be proud of," continues Franklin. 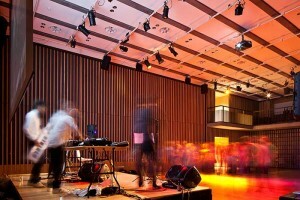 The Performance Hall sits alongside offices, cafes and dance and art studios. There is also a fully HD-ready cinema, for which Charcoalblue specified technical systems and designed the seating arrangements, along with the building wide, fully integrated paging systems. Promising to be an exciting place for anyone to visit, the JW3 says that through a programme of events it aims to transform the lives of the tens of thousands of Jews who live in and around London. Its programme is already jam-packed with more than 1,300 events scheduled for the opening three months and is currently boasting celebrity appearances from the likes of Kevin Spacey, Nicholas Hytner, Ruby Wax, and Zoë Wanamaker.